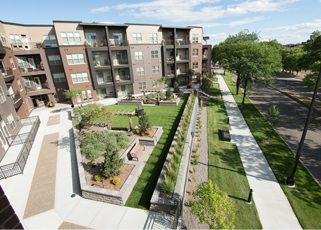 Lyndale Plaza offers new residents the best value in convenience and style with 94 apartments at 6401 Lyndale Avenue South. The newly designed homes are minutes from retail shops, restaurants and walking distance to nature trails. A transit plaza, which includes downtown express bus service, is integrated into the transit friendly design of the 2.5-acre site. The new four-story building is set back from Lyndale Avenue with landscaped green space along the avenue. The building itself features the highest quality construction and a modern design including a combination of masonry, brick and cement materials with masonry finishes. 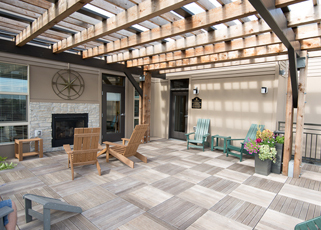 Grills and seating areas are on the elevated plaza for resident privacy and most units have balconies or patios for more outdoor living space. Away from the traffic and noise of downtown, but close to the action, Lyndale Plaza offers an ideal balance in apartment living.